Send him a BBQ gift set! 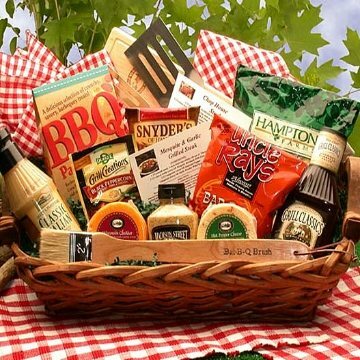 Master Of The Grill Barbeque Gift Basket. What man wouldn't enjoy this gift of flavors and handy grilling utensils. This is a perfect gift for Father's Day this summer. Grill Classics Barbeque Sauce, Uncle Rays Barbeque Chips, BBQ Party Snack Mix, Grill Creations Marinade Mix, Classic Italian Marinade, Hot pepper Cheese Round, Wisconsin Smokey Cheddar Cheese Round, Dnyders Pretzels, 2 BBQ Utinsils, 2 Gourmet BBQ Recipe Cards for Beef, Watson Street Dijon marinade mustard, Hampton Farms salty peanuts in the shell, Wooden slicing/ cutting board, all in a wicker tray.